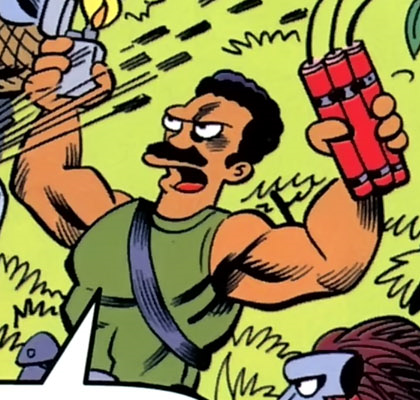 Tyson Neil Degrasse was one of the soldiers in McBain's team in the jungle. Aussie Steve, Tyson Neil Degrasse, and Kicking Chicken was three of soldiers in McBain's hunt on Dr. Malevolent. Steve, Degrasse and Chicken died after they was captured by cybertronic orangutans. When McBain later died and went to hell they was angels and rescued him and send him back to life with holy handguns. Tyson Neil Degrasse is a reference to astrophysicist Neil deGrasse Tyson. Comic story – Have Bodybag, Will Travel! Modified on September 27, 2016, at 12:11.